Promising pop country star Michael Jackson Montgomery announces the upcoming release of his long-rumored, long anticipated album The Bleeding Cowboy on April 9th, 2013. 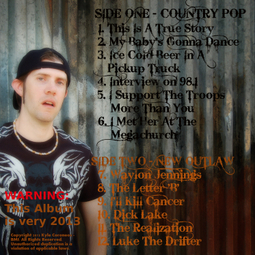 Constructed from various studio sessions that were supposed to go into making two separate albums, The Bleeding Cowboy is a cross section of popular country music in 2013. Written by professional Music Row songwriters, with each song scientifically formulated to be a mega-hit, the songs were initially shelved when the mega-franchise Michael Jackson Montgomery was cast to be a part of was abandoned by the major Nashville record label who launched it. After a protracted court battle, Michael Jackson Montgomery has won the right to release the songs he worked so hard on. Many of the songs on The Bleeding Cowboy were completely finished, but the album also includes some scratch tracks, unfinished recordings, and other studio outtakes and pieces of audio culled from the Michael Jackson Montgomery project. "I worked really hard on these songs, and this is an album with a message," says Michael Jackson Montgomery. "It’s a concept album really, and folks will really be surprised what happens at the end. Despite being from a bunch of different studio sessions, it reads like a book. I’m pretty sure it will be the best album of 2013." Though The Bleeding Cowboy is being released without a label, Montgomery says he's not opposed with working with another major label again if one wanted to pick up the project for wide release. He is also actively pursuing endorsement deals with Axe Body Spray and Takamine Guitars. 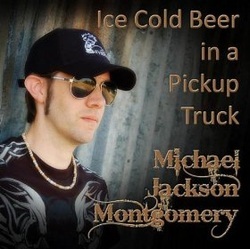 Accompanying the announcement of The Bleeding Cowboy, Michael Jackson Montgomery also released a new single, "I Support The Troops More Than You."